The thought of using shipping containers as housing in disaster torn areas certainly isn’t new, but up until now it was only a concept. Now, a group of researchers from Clemson University, called SEED, could make the idea into a reality. 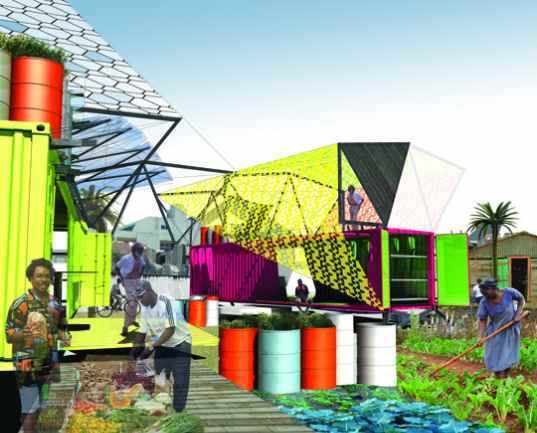 The team had been working since Hurricane Katrina to develop a plan to roll out shipping containers and transform them into housing specifically for the Caribbean region in the event of a hurricane when they received word about the disaster in Haiti. Now the group is working double time to try and get their plan launched to help the victims of the earthquake. SEED’s plan for emergency housing involves utilizing shipping containers, which are strong enough to withstand both hurricanes and seismic activity. Upon arrival, strategic holes would be cut into the sides for light and air. The exteriors would receive a coating of insulating ceramic paint and other modifications to make the boxes liveable, like using wooden shipping pallets that act as “pods” for bathing and cooking. Each container would also receive a starter garden consisting of a 55 gallon drum filled with dirt and planted for “emergency food restoration.” Reused tires would be included to create instant raised beds. Without plumbing and electricity, SEED’s plan is really just to provide safe and non-toxic emergency housing for the short-term, but the containers could likely be modified to be more long term. i believe that we should stop talking about shipping containers and start thinking about haiti. haiti is mountainous--really mountainous. port-au-prince, home to a quarter of the population, is partly in mountainous and partly in coastal plain. the majority of the haitian population lives as subsistence farmers and mostly up in the hills. where i spent the last three weeks, above petit-goave those hills are very very rugged and the preferred method of transport is motorcycle. most people do not have direct access to a road and materials will have to be carried by hand or mule. additionally, where i was working, 100% of the homes were destroyed and people generally have no savings. sure shipping containers could help in coastal plain towns like leogane, near the epicenter, that town was devastated. but let us remember that the damage to haiti was very extensive and the majority of those affected do not live on level ground. Nosilverbullet is a US FEMA plant and completely and utterly wrong on all counts. Ocean containers are definitively seismic resistant: if not stacked, they are the most seismic resistant structure in the world today. He knows nothing of Haiti, and merely soured on the use of containers because the folks in Mobile wanted nicer windows. The point you are all missing is that (1) containers are available right now by the tens of thousands from ocean carriers and manufacturers for $1300 in China, less than $2200 delivered to Panama or Haiti. (2) they are immediately habitable, and the families that need them are not the fussy idiots of Nosilverbullet's aquaintance. (3) the Haitians are accomplished steel workers. Without any guidance from experts like Nosilverbullet they can make these livable, safe and infinitely preferable to tents in the infested mud. Only thing missing is a means to get them to Port Au Prince and enough rolling flatbeds/chassis with lift capability to put them where the locals can clear off some rubble. It seems to me that the total cost of providing this immediately is a fraction of the cost of the crap promised but not delivered by the Clintons and others. Bob, The missionaries that we were staying with in Haiti have been there for about 30 years. They get containers from Missouri and it costs them about 12k to ship each container. They informed me that there is an organization that will load up containers with beans and rice (the basics for survival that most organizations are using) and ship them directly to PAP for a fraction of the cost of most of the other companies. Plus, it saves on the cost of getting food from one place and the container from another. One stop shop. In response to buying the container for an additional $1,800: I heard an ad on the radio the other day and there is a mission organization in Haiti (they have also been there 30+ years) who is building houses for $1,500. They are using local labor and reusing as much material as possible (integrating concrete rubble into the foundation, reusing tin sheets for roofing, salvaging masonry units to use for walls, etc.). I read through their website briefly and it seems intriguing from all angles: 1) Permanent structure for $1,500 (no cost waste with temporary housing now and then coming back to rebuild permanent) 2) Providing income for local Haitians 3) Providing hope for local Haitians as they become a part of seeing their community rebuilt 4) Much more efficient from a cost perspective to hire Haitians then buy a plane ticket for an American to go down and work (that is needed for assessment, management, and exposure but I would say not manual labor for the most part). Thanks for all your work guys. Even though the media isn\\\'t covering it anymore there are still hundreds of thousands of Haitians still in need of help. Lets keep it up! Shipping containers are not good for earthquake prone areas, even less if piled one on top of the other. Oubailey & any others interested in sandbag housing. Follow this link; http://www.earthbagbuilding.com/projects/sandbagshelters.htm Nadir Khalili was doing this work, specifically for poor areas dealing with earthquakes and heavy storms since the 80's. I got to meet and study with him briefly in 89-91'. He's gone, but his strategies for just this sort of situation are totally immediately relevant and the group that carries on his work is not looking to profit from it. Oubailey, thanks for your thoughts and your first hand experiences. Good to get first hand info on what is going on and what is possible. We need more people to report back. I just got back from Haiti a week ago. I went with a construction team from my church and did mostly demo there. The roads are cleared up now and we even saw a semi-truck up in the hills so transportation of a container is at least feasible. Many organizations are having containers brought in from the states that are pre-loaded with building materials. Getting the containers there is possible. We actually saw a couple of containers next to some collapsed houses. The people seemed to be using them just for storage of street items they were selling. It had no cut outs for windows/air passage/light which could have been part of the reason they were not living in it. The cost to buy materials in Haiti is outrageous. Haitians have cut down most of their trees to use for coal so lumber is very hard to come by and when you do find it it is expensive. It is actually cheaper to load up a container of materials in the states and then ship it there then it is to buy them in Haiti. With the cost and effort involved in getting a container there I am more prone to seek out a means of building with the concrete rubble. You have the manpower to accomplish tasks. Hundreds of thousands of Haitians are just sitting around trying to get by. Is there 1) a way to "employ" these men to build houses as a more efficient use of donated funds from the US? 2) a way to build houses out of the concrete rubble? 3) a way to combine 1 & 2? I really don't know the best solution for this problem of efficient housing (container or no container). I simply want to equip you with my observations and spur on more conversation about how to tackle this need. Thanks. shipping containersd are difficult to manage away from ports and decent roads. you can not move everybody away from their lives, ie closer to where it is convenient to put shipping containers. it'll work for some but not for many. the current problem is how to save lives when it starts raining. A roof over the head can be accomplished with a tent but how do you keep people up off of the soaked ground. Deaths of exposure will result if people are sitting IN the wet mud. There are old pallets and discarded new and used carpet scraps in dumpsters all over the country available for FREE. All that needs to be done is the collection and shipping of the stuff. Put them up on some pallets with a piece of old carpet on top and they can at least have a fighting chance of staying warm long enough to survive the rain. How easy does it have to be before we can get started? The carpet and pallets are available for the cost of ' someone driving there and picking them up'. Now we just need some help shipping it . A first step as mentioned by Trout is wtaer purification and septic field is correct. Without that life is extremly difficult. In order fo concrete to be used you could crush all the existing destroyed structures but there are no decent roads to transport the product, so infrastructure repair is another high priority. In order for concrete to be stable in tension you need re-bar so you do not end up with the same problem with building falling apart in the next earthquake. To use corn for bio-plastics is a stretch as they don't have enough food to eat and corn could be used to feed people instead. The key is clean water, septic systems, rebuilt roads and inexpensive building solutions with recyleled materials. I think Trout's may be on to something. What is there in Haiti that can be used? How can the community be given some basic skills to do it for themselves? I hear about water purification systems that can serve a community having been brought in, (10 of them) and I start thinking about building communities that are centrally located around water purification and greywater systems with septic spray fields that release at a content of 99% clean, What about materials that are there? They have a lot of destroyed concrete. Crush it, bag it and start using some of Nadir Cali's principles of building based on ancient middle eastern geometry. Think about stacking communal walls in a radius using the Fibanacci sequence. It doesn't tumble easily in an earthquake. Find a way to waterproof the whole and you can build rooms with common walls much like row houses. They have Bamboo growing there. It has excellent structural properties. They grow corn, Corn starch, veg. oil and water and you can make bio-plastics with possibilities for many architectural elements. Living in a metal box in the tropics? Plastic pop ups in a tornado? Look at what is there. Look at who is there. Building planned communities around viable water and waste systems can be a big step forward for Haiti. Learning how to make their own communities, providing themselves employment, self respect and hope for the future are huge. Recycling debris is way better than the plan of transporting in and bolting down metal containers when hundreds of thousands need lasting shelter. There is nothing hurricane resistant about a shipping container. On the Gulf Coast during Katrina, structures much larger and heavier than shipping containers by several orders or magnitude (read: casino barges) were thrown hundreds of feet by storm surge, and mobile homes are routinely destroyed in high winds. You need serious foundations and strapping to make shipping containers work, and at that point, you are well into construction. I don't disagree that modular construction can be more efficient, but it's not clear to me why everyone thinks that module should be a shipping container. Modular homes and parts are built throughout the US and those can be used with no more work than it takes to make a shipping container humane habitation. I think the fetishazation of the shipping container and the desire to believe that it is an efficient module really blinds people to the availability of better solutions. It's no harder to bring in other materials or modules than it is to bring in shipping containers, which need to be brought in on Haiti's limited infrastructure, as realsolutions points out. Plenty of people showed up in the Gulf Coast wanting to use shipping containers, but none of those projects went forward, and a lot of different approaches were tested out on the ground. Building houses one by one is not a viable solution for Hati. A modular solution is a much more realistic way to deal with hundreds of thousands of homes. Many people in Hati are extremly poor and any shelter that keeps them dry and out of the elements is a big improvement in their lives.If shipping containers or some other similiar module could be built and equiped before shipping that would be ideal. Planning for the placement of these modules need to be done upfront so infrastructure is in place and the community could be designed to function as a real neighborhhod. Trying to build hundreds of thousands of homes on a one by one basis is not realistic or feasible in Hati given the lack infrastucture to deliver all the different materials required to build a home. A shipping container is much more hurricane and seismic-resistant than the hundreds of thousands of collapsed building there now even if they were just sitting on compacted dirt with gravel underneath. I know it seems like a compelling idea, but shipping containers are not a good solution to humanitarian crises. I worked on the Gulf Coast rebuilding for three years after Katrina. A number of groups came in wanting to use shipping containers for housing, but even with ceramic paint it takes an enormous amount of time, effort, and materials to make a large metal box habitable in a hot humid climate. Cutting into the skins to allow light and ventilation undermine the structural integrity of the containers. And they are neither hurricane-resistant or seismic-resistant unless they are carefully tied to well-engineered, site-built footings. At that point you have put in enough work and material to have built a house that is actually habitable in the long-term and that a family actually wants to live in and that can accommodate the right number of people and respond to other needs like handicap accessibility. Even as temporary housing, these require so much effort to make habitable that it is a much poorer use of resources than it would seem. It would be great if there were a silver bullet for disaster recovery, but there isn't. You have to do the hard work of pulling together resources to help families rebuild one by one. And building houses that people want to live in and care for is really the most sustainable way to build. I think it's a good idea but I must say that the concept drawings with fluorescently coloured containers with abtract art on their roofs being dropped off by helicopters makes me think that it's a bit of an architects fantasy. Hope they can get something real going. It will take a long time before everybody there has a decent roof over their heads. My friend Alex is involved with a company SG Blocks that is providing containers for Haiti. The company I work for Quick International Courier is providing Logistics for Charters to get Red Cross Blood and News Crews to Haiti. We are exploring how we can help each other. The thought of using shipping containers as housing in disaster torn areas certainly isn't new, but up until now it was only a concept. Now, a group of researchers from Clemson University, called SEED, could make the idea into a reality. 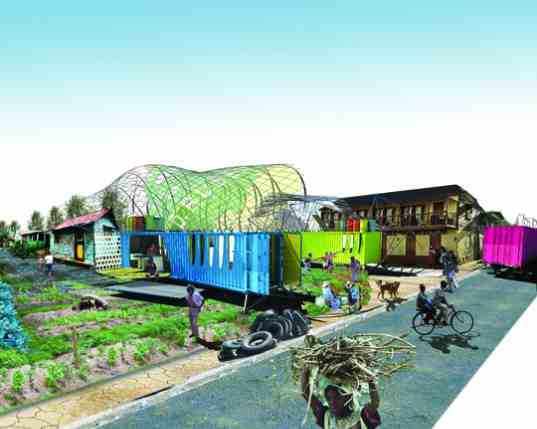 The team had been working since Hurricane Katrina to develop a plan to roll out shipping containers and transform them into housing specifically for the Caribbean region in the event of a hurricane when they received word about the disaster in Haiti. Now the group is working double time to try and get their plan launched to help the victims of the earthquake.